About this time of year, I keep getting twinges of regret that I’m not at Glastonbury Festival. I’m being stubborn and keep telling myself that I won’t return until the disappearance of the youths who spend hours on their hair and makeup in their tents and then updating their Facebook status to let everyone else know what an AMAZING TIME they’re having, instead of just getting muddy and sweaty and having a good time like the rest of us. I know I’ll return eventually, but not until the memory of watching a never-ending queue of teenage Peaches Geldofs washing the mud off their designer Wellington Boots under a running tap – and then stepping right back into knee-deep mud, presumably with a view of joining the back of the queue again – has faded. Still, I managed to find my first festival of then year, in France, and all by mistake, too. I stumbled into Cahors on the Sunday night, expecting little. Most French towns die down to Marie Celeste-type emptiness after 8pm, but on the previous night I’d seen a band playing in the street and wondered if something of interest might be going on. 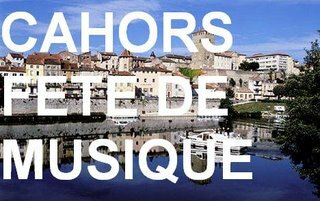 I was right, and then some: it was the Cahors Fete de Musique – the annual music festival. Somehow, on the previous day’s wander, I’d missed all the huge, yellow, five-foot-high posters advertising the event. ANBAD has its ears to the ground, oh yes. The old town of Cahors is a beautiful medieval, labyrinthine city, with most buildings older than, say, the whole of the USA. On every tiny street corner there was a band. There was a band in every square, too. And outside the market hall; inside and outside of bars; in the middle of wide roads, shoulder-width narrow passageways – everywhere. And almost all, without exception, were exactly what you’d expect of French rock bands – blander and more inoffensive than, I don’t know, Deep Blue Something. In fact, if I have brought myself to have hung around to hear the band that was covering Two Princes by The Spin Doctors, I’d have gambled my last centime that Breakfast At Tiffany’s was coming up next. There were so many ‘blands’ it made my head spin – garbled covers of the Rolling Stones (“Street flyin’ man”), A DJ that was playing DJ Otzi megamixes (I never knew there were enough DJ Otzi songs to warrant a megamix), and the main event – a band that sounded like the French Levellers. I continued walking. The fact that there was a band everywhere meant that quantity was high, even if quality was low; eventually, I wandered down an alleyway, and found a French hip-hop/punk/ska hybrid band that were, in the context of things, pretty good. The narrow street fairly had sweat running off the narrow, high walls as teens pogoed to the yelpy ‘n’ angry sounds from the MCs, but I stood a little way back, so that they wouldn’t knock my glass of local vin rouge, which in retrospect is awfully middle age/class. They reaffirmed my faith in live music after the numbness of earlier. French is one of the few languages that suits being rapped perfectly – Welsh is another surprising candidate – and they hauled the crowd into the air again and again, through the strength of their lyricism. It was a great way to end the night, and try and remember which way out of the maze of streets led back to my tent. So: this band would have been New Band Of The Day, but I’m not brave enough to strike up a conversation with some angry French Hip-hoppers with my basic schoolboy French, so we’ll never know. Instead, here’s some classic-ish French-hop from IAM. Posted on June 26, 2009 by Joe Sparrow. This entry was posted in Today's New Band and tagged ANBAD on tour, French. Bookmark the permalink.